I have used a Sweet Sugarplum cardstock base with a layer of the gorgeous Fancy Frost Specialty Designer Paper. Then I have stamped the flower from the Flourishing Phrases stamp set with Bermuda Bay, onto Pool Party cardstock, sliced it up & stuck it on with Dimensionals. I felt like it still needed another layer underneath but it was too late to pull it back off, so I went around the outside with my Bermuda Bay Stampin' Write Marker & I'm super happy with the effect! This was a little trick I learnt off the amazing Brian King! Love that guy! The banner stamp & XOXO sentiment come from the Bloomin' Love stamp set & I have cut out the banner with the little banner die from the Large Numbers Framelits. I love how Stampin' Up! coordinates all it's products! I also added a bit of the Copper Thread under the banner. I have matched the inside with a layer of Whisper White cardstock, stamped with Sweet Sugarplum & Bermuda Bay using the sentiment & image from the Flourishing Phrases stamp set - I love this stamp set!! And it has matching framelits, too! Perfecto! 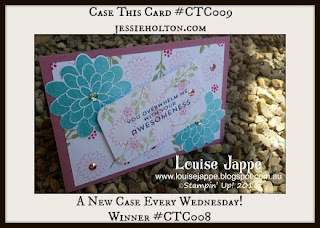 I have also entered this card into this week's Crazy Crafters Project Highlights. You can see all the entries & vote for your favourites from 7.30pm tonight!